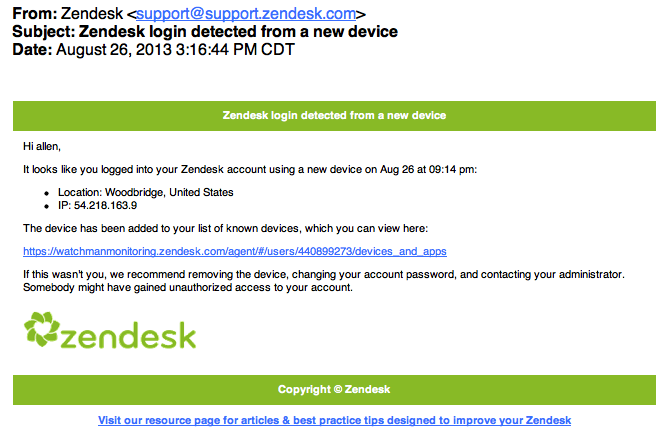 One of Zendesk's security features is an email notice when new login patterns are noticed. After implementing our Zendesk integration, our servers act on your behalf. This activity may trigger an alert, such as the one pictured below. Our servers are hosted in Amazon's US-West (Oregon) data center and may have any random IP address from that location. If Zendesk sends a login notice, and the reverse lookup corresponds to us-west-2.compute.amazonaws.com, it is reasonable to assume that all is well. 9.163.218.54.in-addr.arpa domain name pointer ec2-54-218-163-9.us-west-2.compute.amazonaws.com.